Our neighbours, Colin & Linda, 300 metres southward, aren't arriving till August, however their banana tree got the dates wrong and bore fruit three months early. 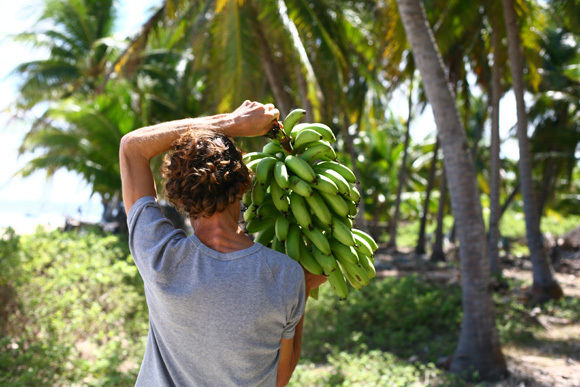 Their housemaid generously offered the bunch to us, being we are the number one banana consumers in the village, and Aquaman carried it home where we waited impatiently for five days until they ripened. Green smoothie with banana, papaya and banana, banana with dates, banana on a plate, banana in a bowl, and best of all, banana eaten as nature intended, in the hand, straight out of its own biodegradable packaging.